In an effort to keep trying new things, I adapted my normal cheesecake recipe for Mothers’ Day to incorporate some white chocolate, changed the strawberry topping I usually use, and tried out a new crust. The addition of white chocolate, however, might make its way into the normal recipe, as it really enhanced the creaminess and flavor of the cheesecake. I also got a little fancy with decoration, using a white chocolate truffle ganache to line the outer edge of the cheesecake to contain the strawberry gelee in the center. The strawberry gelee kind of tasted like strawberry jam, though I suppose strawberry syrup is not far away from jam. I’m not sure it was as good as using fresh strawberries like I’ve done previously, but it made the presentation better and that was my intent. And the truffle ganache… it’s really good. I’m not really sure why it’s called “truffle”, but the addition of mascarpone cheese to white chocolate ganache made it somewhere in between a frosting (without having to whip) and a ganache. I intended on using Biscoff cookies for the crust, but I wasn’t able to find any at the local grocery store, so I opted for some Lorna Doone shortbread cookies instead. I also added some brown sugar to give it a more caramel-y flavor, which I think made it a fantastic partner to the white chocolate and strawberry. This was definitely a treat that called for “second dessert” a few hours later. For the crust: Heat oven to 350 degrees. Lightly butter 9″ springform pan (this all fit in a 9″, but 10″ would work too). Wrap springform pan in aluminum foil and place on baking sheet with at least 1″ sides. Use Cuisinart food processor to blend cookies into fine crumbs. Melt butter and, in separate bowl, mix well into the crumbs and brown sugar. Pour the buttered, sugary crumbs into the springform pan, and firmly press the crumbs into the bottom of the pan (don’t go up the sides, it’s easier and the crust bakes better). Cover and refrigerate until cheesecake batter is ready. For the cheesecake: Scald heavy cream in a small saucepan, then pour over white chocolate in a separate bowl. Let the cream melt the chocolate for 5-7 minutes, then whisk the mixture to fully combine. Set aside and cool until luke warm. In Cuisinart food processor, beat softened cream cheese and sugar until smooth, then add cooled white chocolate cream mixture and continue to beat. Add in vanilla and ricotta, then mix until incorporated. Add eggs, one at a time, and mix until just incorporated. Pour into chilled, prepared springform pan. Place baking sheet with springform pan into the oven, then pour hot water onto the baking sheet approximately 0.5-1.0″ up the sides of the springform pan. 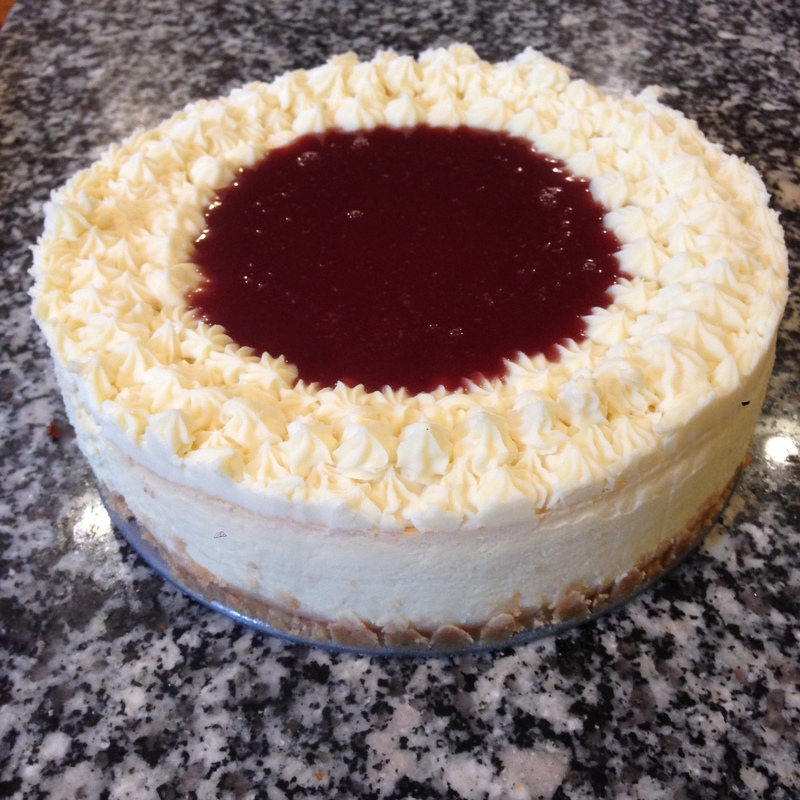 Bake for 90-120 minutes, or until the top of the cheesecake has just solidified or has a slightly wobbly center. Remove baking sheet from the oven and allow the cheesecake to cool. Transfer springform pan from the water bath once it has cooled, and allow cheesecake to cool completely. Run a knife along the side of the cheesecake to loose from the sides of the pan. Cover and chill in the refrigerator while toppings are prepared. For the truffle ganache: Scald heavy cream in a small saucepan, then pour over white chocolate in a separate bowl. Let the cream melt the chocolate for 5-7 minutes, then whisk the mixture to fully combine. Add mascarpone cheese and mix until incorporated. Cool to room temperature, then chill in the refrigerator until mixture achieves consistency to frosting (about an hour) as desired. If piping takes too long, the truffle ganache will begin to melt but can be firmed up with some additional time in the refrigerator. For the strawberry gelee: Reduce strawberry syrup in a small saucepan over low-to-medium heat until about 1/2 cup remains. As the syrup reduces, in separate small bowl or cup, combine gelatin and water. Let mixture sit for a few minutes. Combine hot syrup and gelatin in the small bowl, then mix until combined. Allow to cool a bit on the counter, then cool further in the refrigerator until thickened but not set (I checked every 10-15 minutes until it was cool to touch and still pourable). Spread cooled strawberry gelee over chilled cheesecake. Once chilled, remove the springform pan to serve.